Available composite cyclical indicators for Russia are surveyed, and their components are enumerated and analyzed. The aims, guiding concepts, and approaches of the newly established Russian Economic Cycle Dating Committee are also described. All the currently available monthly composite leading indices (CLIs) are tested against the most recent cyclical turning points for their capacity to provide a timely alarm signal, especially about an impending recession. It is shown that experts’ informal judgments about Russia’s future economic trajectory remain more informative than findings derived from formal empirical rules. This suggests that there is some room for improvement of the Russian CLIs, and additional efforts should be made to construct better cyclical indicators for Russia. The author is grateful to Iaan Venter and Ataman Ozyildirim for their helpful comments. Any remaining errors and shortcomings are the responsibility of the author. Support from the Basic Research Program of the National Research University Higher School of Economics is gratefully acknowledged. 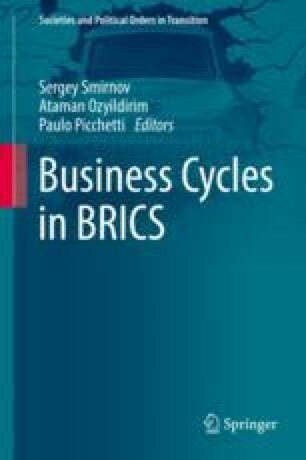 Cycle of economic activity (business cycle): Fluctuations in Russian economic activity that continue through several quarters for 10–12 years or more. A full cycle in this sense comprises two phases: growth and contraction (recession), which do not adhere to strict pattern of periodicity. Phases of growth and contraction (recession): Alternating periods of overall increase and decrease in economic activity. During the growth phase, production and sales volumes of goods and services in the entire economy, and in most sectors, grow; in the contraction (recession) phase, they fall. Turning point: A moment in time immediately preceding the transition of the economy from one phase to the other. Peak: A moment when economic activity is at its maximum, followed by the economy’s transition from a growth phase to recession. Trough (or bottom): A moment when economic activity is at its minimum, followed by the economy’s transition from recession to growth. The RDC’s goal is to date turning points in Russian cycles of economic activity (business cycles) to appropriate months. The RDC does not see it as its goal to date turning points of growth cycles (deviations from the long-term trend) or growth rate cycles, nor does the RDC develop or test theories that seek to explain the existence of economic cycles or identify drivers of any particular cycle or cyclical phase. Any member of the RDC may, as an individual, study these issues, but their opinion on such matters should be considered as their own personal view. When offering real-time comments on the state of the Russian economy, members of the RDC may define the Russian economy as reaching or not reaching a recent turning point (peak or trough). The RDC will formulate a consolidated position of its members over time, taking as much time as is needed to conclusively analyze the situation. Every RDC member uses those indicators and methods in their analysis that they feel are most useful. RDC members form a consolidated position through open and grounded discussion of the results put forward, taking into account not only the results of statistical tests but also members’ qualitative analyses. Although the RDC’s decisions always relate to the past, rather than the current state of the economy, it would be erroneous to assume that they are “delayed.” The RDC seeks to date turning points as soon as it becomes clear that the coming change in economic activity will not be a continuation of the preceding phase but will constitute a new phase of the cycle; besides, statistical data that appears should enable these turning points to be discerned with reasonable accuracy. As a rule, this takes 9–18 months, from the month of the turning point. If the subsequent revision of Rosstat data radically changes the perception of the course of the Russian economic cycle, then the RDC may update the turning point dating. If there are two or more months that offer almost similar grounds to be considered turning points, the RDC prefers to choose the later one. Results of and grounds for dating are published by the RDC in dedicated press releases on the RDC website. Dating of cyclical turning points established by the RDC can be used for further analysis of historical economic dynamics in Russia, and to predict future dynamics, in particular in developing and calibrating systems of leading, coincident, and lagging indicators.